A man connected to a notorious murder is back in jail after police say he tried to kidnap women Tuesday in Russellville. RUSSELLVILLE, Ark. (KTHV) - A man connected to a notorious murder is back in jail after police say he tried to kidnap women Tuesday in Russellville. Juries twice failed to reach verdicts when Gary Dunn was charged with killing beauty queen Nona Dirksmeyer in 2005. Just four months after getting out of prison for another incident, police accuse Dunn of approaching at least three women and trying to kidnap them. Ewing says officers got a call at 7:38 p.m., to the parking lot of First Baptist Church to a woman who said a man tried to force her into her car. When officers arrived, the suspect had already left the scene, but the victim and witnesses provided a description of both the suspect and his vehicle, which was broadcast to surrounding agencies. 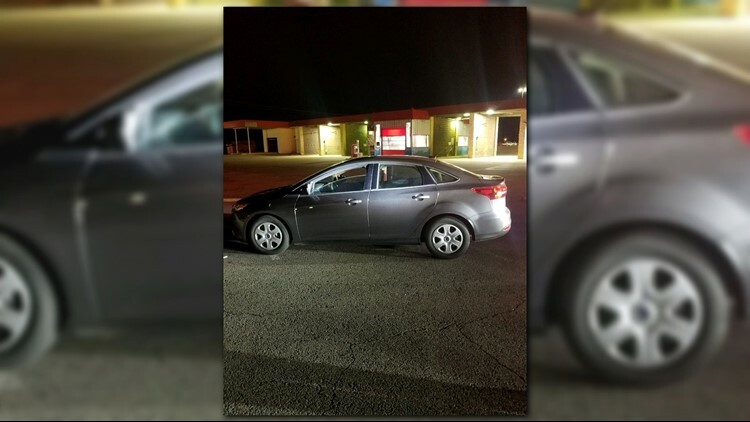 The description of the car and man were similar to a 911 call made by a student at Arkansas Tech and a call about a suspicious man approaching a woman in a shopping center parking lot all within the same hour. The woman at First Baptist told police that the suspect approached her in the parking lot and attempted to force her into her vehicle. The victim said that she was able to break free, and the man left in his dark sedan with temporary license plates. Russellville police sent out an alert and a couple hours later, Dardanelle police just across the Arkansas River tracked down Dunn's car and arrested him. Investigators from Russellville came and got him, locked him up and charged him with attempted kidnapping. As it unfolded, veteran police officers heard the description and the m.o. and immediately thought of Dunn. Suspect's vehicle. Photo courtesy: Russellville Police Department. Dunn was accused of beating Arkansas Tech student Nona Dirksmeyer to death in 2005 in a case that still haunts the city. Police first arrested Dirksmeyer’s boyfriend at the time, Kevin Jones, but a jury acquitted him. Evidence at the scene pointed to Dunn, who lived in the same apartment complex at the time, but that evidence was largely circumstantial. After two hung juries, he was not tried a third time. After nearly two years behind bars for his neighbor's murder, Dunn was released from custody. In the ensuing years, Dunn ran into more trouble both after moving out of state and when he moved back to Arkansas. Police say he could never stay off their radar. Dunn is being held on $100,000 bond. Prosecutor David Gibbons says they will take a couple weeks to file formal charges with a next court appearance scheduled for Jan. 14, 2019. Because Dunn was on parole for a different crime, Gibbons says he is not likely to make bond and will remain locked up for the duration of this new case. This story was updated with new information as it was released.